Gardagolf Country Club, host of this year’s 75th Italian Open, has been named as winner of the 2019 IAGO Sustainability Award for Resource Efficiency. The award was announced and presented at a gala dinner at the Ljubljana Convention and Exhibition Centre to celebrate winners of the 2019 IAGTO Awards in front of 1,200 golf tourism industry delegates at the end of the International Golf Travel Market in Ljubljana, Slovenia. The IAGTO Sustainability Awards form part of the prestigious annual IAGTO Awards and are a partnership between IAGTO Awards organiser the International Association of Golf Tour Operators (IAGTO) and non-profit golf sustainability body, GEO Foundation. In his citation, GEO Foundation Executive Director Jonathan Smith said: “Following a hugely successful Italian Open this year, where sustainability visibility was at the forefront, Gardagolf Country Club, has been selected as the Resources category winner for 2019. “A new ultra-modern irrigation system was recently installed for precise and minimal applications to the required playing surfaces only. Over the past year course management has been free of any pesticides, in preparation for an increasingly organic approach to turfgrass health. Orlando Tradati, President, Gardagolf Country Club, who received the award with Director Loris Vento, said: “We are so honoured to be recognised worldwide with this prestigious award. We are proud of being the host venue of a hugely successful 75th Italian Open, the first one in history ever awarded to a golf club with GEO Foundation Certification. 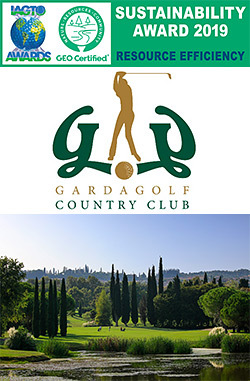 The concept of building a golf course in Valtenesi, just a few kilometres from Lake Garda, which contributes to improving the climate of the valley, was the result of the entrepreneurial skills and foresight of Riccardo Pisa and Giorgio Simonini, who in 1984, realised the potential of combining a sports initiative and a real estate project. The first 18 holes, inaugurated on 28 June, 1986, were designed by Golf & Gardens and the English firm Cotton, Pennick, Steel & Partners. A new nine-hole course was then inaugurated in 1990.